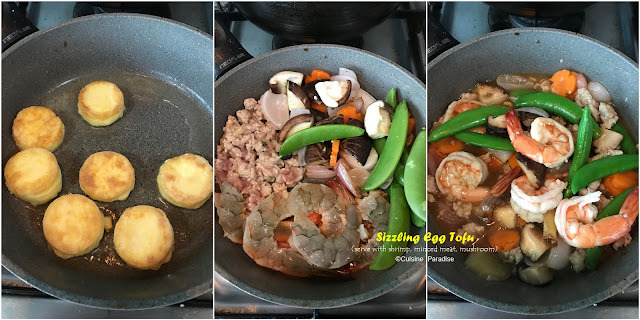 Here are three quick and easy Asian one-pan dish which are a real time-saver for weeknight dinners. Furthermore these dishes also make great family meal ideas because you just need a reliable frying pan to cook with and serve. Therefore it cut down working time in the kitchen too. Braised Fish Head with bitter gourd is one of the common cze char dish that loved by many patrons. Here with similar ingredients and cooking methods, I replicate it by replacing bitter gourd with egg tofu then serve with purple sweet potato rice. Watch how we prepared this Braised Fish Head with Tofu. 1. 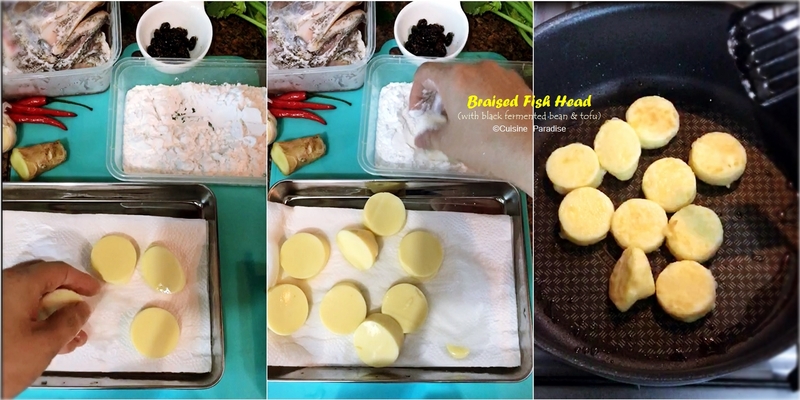 Rinse and pat dry fish parts then marinate it with 1/2 tablespoon cooking wine, 1/4 teaspoon salt and 1 teaspoon grated ginger juice for at least 10 minutes. 2. Meanwhile, dust egg tofu with cornstarch then pan-fry on medium low heat till golden browned, remove and set aside. 3. Heat 1 tablespoon of oil in a skillet, add in marinated fish parts (lightly dust with cornstarch) and saute till both sides are browned. 4. 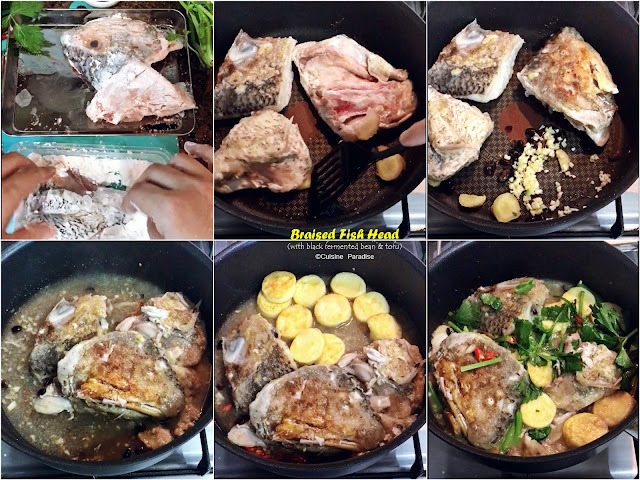 Push the fish to one side of the pan; add in the chopped garlic, ginger, shallot, chilli (optional) and fermented black bean. Give it a quick stir and sauté till aromatic. 5. Next add in seasoning and tofu then simmer (remember to cover the pot) for about 2 minutes on medium low heat to allow fish and tofu to absorb the seasonings. Top with chopped coriander, remove and serve warm with rice. 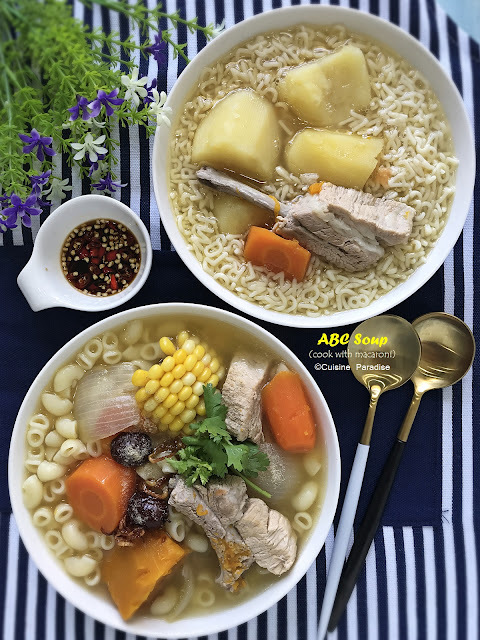 Nowadays more people are starting to live and eat healthy despite that white rice is a common staple in many Asia country. For me I love to mix and match different types of grains in our daily diet. And to start off with you might want to try mixing white rice with assorted grains like; brown, red or black rice then slowly decrease the white rice to suit your preference and body condition since fibers might not be easily digest. You can read more on our mixed grains rice post HERE. One-pan sizzling egg and tofu dish serve with hairy melon soup and steamed rice. This tofu dish is suppose to serve on hot plate in order to hear the "sizzling" sound effect but since we are preparing it at home, you can just use any medium size non-stick pan to work with. 1. Divide egg tofu into 8 pieces of equal thickness then lightly dust it with cornstarch and shallow fry with 2 tablespoons of cooking oil till golden brown on both side. Remove and set aside. 2. Saute garlic, ginger and onion till aromatic, add in minced meat and shrimp then stir-fry until meat changes colour. 3. Next stir in sugar pea, carrot, mushroom then continue to cook for another minute. Mix in seasoning. 4. Lower the heat, arrange fried tofu in between the mixture then swirl in beaten egg and let it cook till almost set (do not overcook as the heat from the pan will continue to cook the egg mixture). 5. Lastly remove skillet from heat, garnish with chopped scallion and chilli. Serve immediately. Thia Basil Chicken aka pad krapow gai is one of the popular Thai street food of all time. 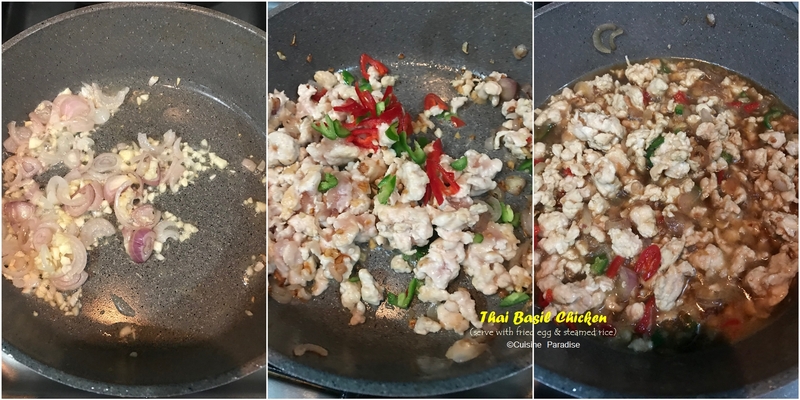 You can easily replicate this dish at home and all you need are some minced meat (beef, chicken or pork) or seafood plus handful of Thai holly basil. By all mean you can replace holly basil with sweet basil but it does not have that distinctive peppery flavor when compared with the authentic version. 1. Rinse and pick the clean leaves from Thai basil stalks, discard the hard stems and set leaves aside. 2. Heat up oil in skillet then fried egg according to your preference. Remove and set aside. 3. In the same skillet saute chopped garlic, shallot and chilli for a minute till aromatic and lightly brown. 4. Stir in minced chicken and cook until it changes colour (try loosen the meat while cooking to prevent lumps), add in seasoning and simmer for a few seconds till meat the sauce flavour (do not over cooked). 5. Lastly toss in basil leaves, remove mixture and serve with steamed white rice and fried egg. Above are two different types of basil leaves, the one shown on the left is English sweet basil which is commonly used in pasta or pizza whereas the one on the right is Thai Basil which has light purple-white flowers and it is usually used in Thai or Vietnam cuisine. Thai Basil can be found in some vegetables stall in wet market or certain leading supermarkets such as Sheng Siong or NTUC Fairprice. 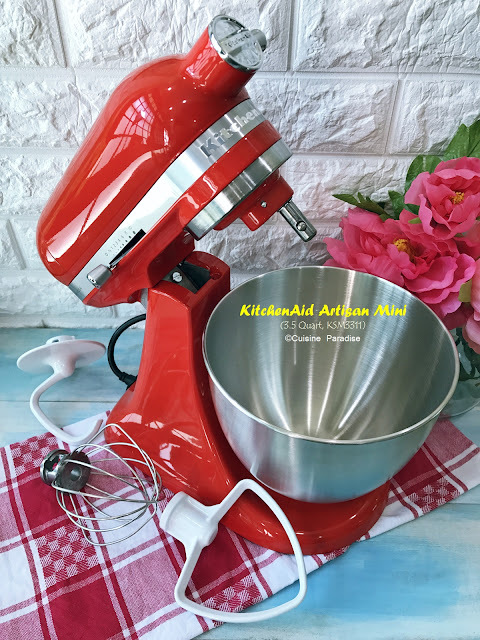 Hope you find the above recipe ideas useful, do lookup for the next post on more quick and easy meal ideas.